According to the statement of Minister of Tourism Mr. Aris Spiliotopoulos, in the event of gastronomic Sani Gourmet Festival where she attended as part of his tour to Halkidiki: "The Greek cuisine is undoubtedly one of the country's comparative advantages as our destination. The quality of materials, variety, traditional cuisine and its evolution in the last years in high quality gastronomy is, in my opinion, an untapped reservoir for attracting quality tourism. Also, Mr. Aris Spiliotopoulos stressed that Greece has to exploit, to present and advertise the kitchen, in the same way we have done France, Italy, Spain and China, which already enjoy benefits of visibility. The private initiative plays a key role in this effort, but the state should supports it. Working in this direction, increasing demand and awareness of Greek cuisine. 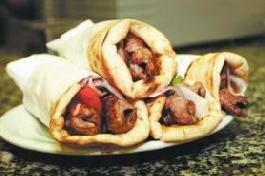 H Greek cuisine has all the potential to become brand name and brand recognition around the world.